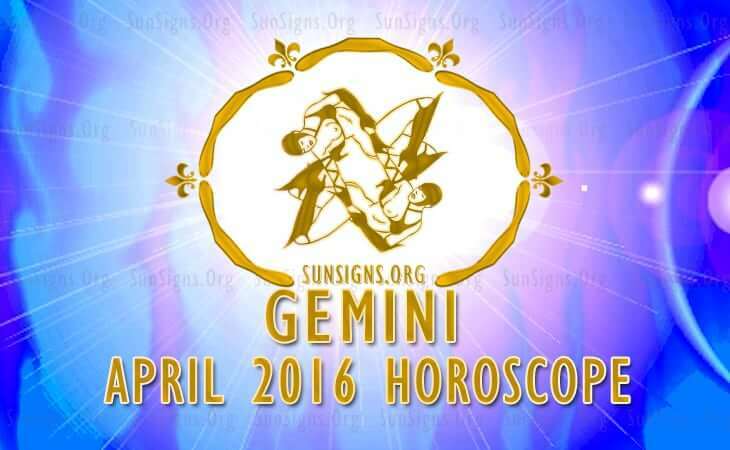 Gemini April 2016 Horoscope predicts that the house of career is powerful this month. This denotes that Gemini zodiac people will have a prosperous professional life, and home affairs and emotional matters will be low key. Family members will participate in your progress in career or business. Gemini, your perception will be good and your career will be guided by ethics and spirituality. The interest of the Twins in philanthropic matters will be helpful in furthering your career. You will be working hard towards improving your self-awareness which will be vital for the growth of your career. With the movement of more than 60 per cent of the planets to the Eastern sector of your astrology chart in April 2016, the Gemini personality will be free to execute their plans. With hard work and motivation, you will attain your goals. You will become more ruthless towards the end of the month because of effects of the 2016 Mercury retrograde. The Solar Eclipse of the 19th will be challenging for friendships and spiritual paths. Only strong ones will stay on course. Gemini men and women searching for jobs will have a fortunate month, but they should scrutinize the details of job offers closely. Businessmen will have an excellent time in April 2016. You have a burning ambition to do something outstanding in business or in your field of work which requires juggling with the various aspects of life. You have to find a solution which is acceptable to all. The Gemini 2016 April monthly forecasts foretell that financial situation improves after the 14th. You have planetary support for indulging in speculative ventures and you can forcefully follow your monetary plan. Your efforts will yield good returns and you can make money easily. Your social skills will be helpful to increase cash flow and technological help can be used to further your finances. The 2016 April love predictions for the Twins are not favourable and formation of new alliances will be rather slow. You can find opportunities for love by dating or with the connivance of friends. Permanent Gemini compatible relationships are not expected and you can enjoy the relationship as long as it lasts. Friends and family seniors will get into love affairs if they are serious about them. There is little scope for pregnancy or marriage in April 2016 for the Gemini. The Gemini fitness levels will be satisfactory in April 2016. You need not make changes in your diet and exercise regime. Conserve your energy to avoid health problems. Change your lifestyle in order to live longer. Overall, the April 2016 Gemini horoscope predicts that good fortune and excellent jobs or business contracts will come your way this month.